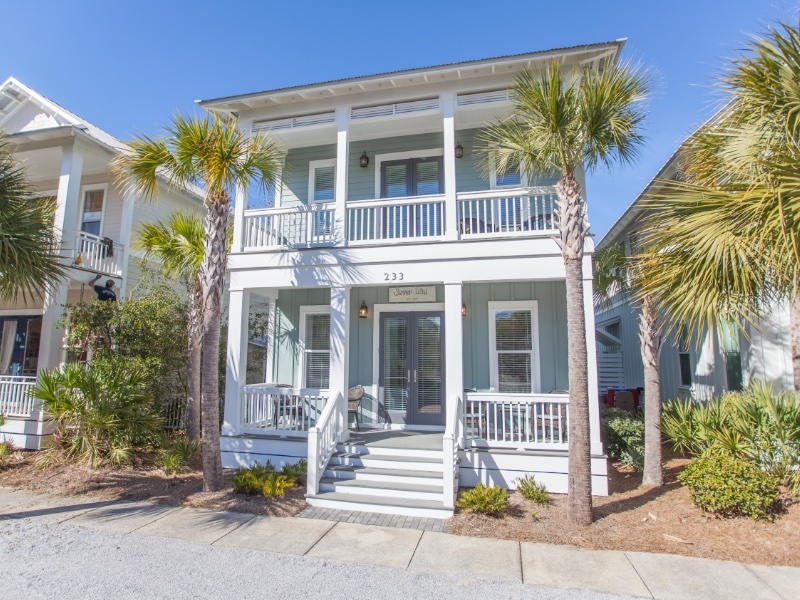 Enjoy endless days of summer fun in this immaculate beach cottage that is new to the rental market and located in the popular community of Seacrest Beach. This charming 4 bedroom, 3 bath home offers an inviting open floor plan with the main living area, dining and kitchen on the ground floor. The kitchen is outfitted with stainless appliances and all the tools needed to prepare your favorite meal. The living area offers comfortable seating surrounded by windows. The living area also has a queen sleeper sofa. The dining area adjacent to the living area has seating for 6 while the kitchen island has bar seating for 5. Off the living area walk out the French doors to the patio with long views of the brick streets of Seacrest Beach. The first of four bedrooms, all with 42 inch LCD TVs, is also located on the first floor with private access to the home. This bedroom has a queen bed and shared bath. Entering the second floor you will find the queen master bedroom with private balcony. The master bathroom has an oversized soaking tub and walk in shower. The hallway to the third and fourth bedrooms on the second floor house the full sized washer and dryer. The third queen guest bedroom shares a full bath with the 4 bedroom that has two twin bunks and twin trundle. Both second floor guest bedrooms share a private balcony. Some of the fabulous amenities in Seacrest Beach include the 12,000 sq. ft swimming pool – which must be seen to be believed! and private beach access. Convenience is the key word here as the home is located only steps to the shopping and restaurants at the Village of South Walton as well as Rosemary Beach and Alys Beach.